1)Cut grapes into half to prevent choking for your child. Present all fruits in an attract way on a plate. 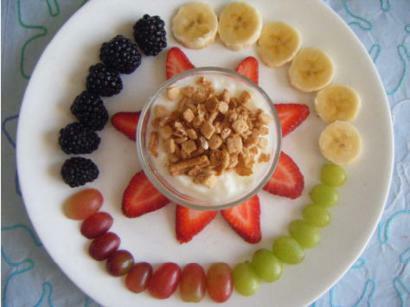 In the center of the plate, place a bowl of ½ cup of yogurt and top with ¼ cup cereals* (low sugar and high fiber is preferred).